Jumpsuits and Rompers are back in style so get your set today! With your jumpsuit and rompers you can dress up or down and look stylish every time. Fashion seems to always change and now what was cool in the past has come back in a new light. At Womenâ€™s Clothing Center we make sure to offer the latest fashion for all women and their budgets. When it comes to designer names we have them all from Bebe to Jolt, Calvin Klein, Guess, Tcec and so many more brands that you recognize and trust! Browse through our site now and purchase your very own fashionable rompers and jumpsuits available in a variety of colors, designs, and of course prices. At Womenâ€™s Clothing Center, we have a great selection of the popular rompers and jumpsuits that have recently come back in fashion. Here at our site you will find numerous of rompers and jumpsuits that will fit your style and will be perfect for work, going out, or relaxing at home. Rompers and jumpsuits are one-piece clothing that show off your legs and make you look stylish anywhere you are. 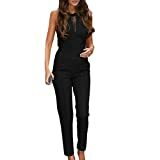 At our site you will find jumpsuits which are long legged, that will be perfect for work or a party event. Rompers come in a variety of styles so that every shape woman can wear them, young and old. Browse through our site now and purchase your very own beautiful romper or jumpsuit.